When school authorities in Cobb County, Georgia, suggested assigning Deena Chachkes to a classroom with 10 other children, her parents balked. They reasoned that even a small class was too large for Deena, then three, who has autism. "You might just as well have had committed her, at that point, to some long-term facility," her father told NBC. Researching alternatives, Jacob and Bonnie Chachkes found the McCarton School on Manhattan's East Side. It has one teacher for every child and offers a variety of highly regarded therapies. So eager was the family to place Deena there that they moved to New York. But they still needed to cover the $80,000 a year tuition. And so the Chachkes demanded that the City of New York pay, citing a federal law requiring that all students receive a free education appropriate to their needs and abilities. According to the Chachkes, the courts ruled that the city Department of Education must reimburse them for their daughter's tuition. The Chachkes framed their experiences to demonstrate that parents with disabled kids have to fight for their children. But some observers, including many in city government, might find a different moral in Deena's story. To them, it indicates how laws passed by the federal government and then interpreted by the courts create huge expenses for state and local governments. Often the federal government provides little or no funding to help cities and counties meet their new responsibilities. 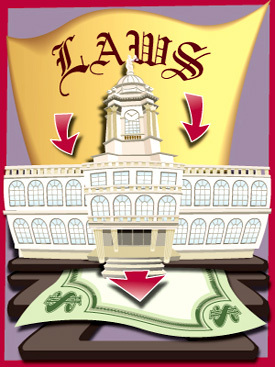 New York politicians have long complained that much of the city's budget and many programs are determined not in City Hall but in Washington, in Albany and in courtrooms. They call them unfunded mandates, or nondiscretionary spending, or uncontrollables, and they say that these expenses restrict local government's ability to create its own programs or to cut taxes. Mayor Michael Bloomberg is the just the latest public official in the city to complain. In his recently-released executive budget, Bloomberg cited what he called nondiscretionary spending totaling $21.5 billion in the coming fiscal year, or nearly half the budget. These are costs, he implied, over which he has no control. But others say that the mayor and other public officials have far more control over these expenditures than they would like you to believe. Former Mayor Rudolph Giuliani used to complain that so-called unfunded mandates were, in effect, undemocratic. "Some of it you would make the political choice to do in the way in which you're mandated to do it, and some of it you'd probably choose [to do] very, very differently," he told CNN in 1994. "So probably 25 to 30 percent of your budget is moving in a direction where, if you had the decision-making at the local level, you'd make the decision not to spend the money that way." But others see it differently. Efforts to limit unfunded mandates "strike at the very heart of the body of laws that binds us together as a progressive society and with the highest standard of living in the world," Representative George Miller of California told Congress in 1995. Many of the unfunded mandates begin with a federal law, says David Schoenbrod , a professor at New York School of Law who has written extensively on the subject. Then, a government agency issues regulations to enforce that law. Finally, federal judges issue consent decrees setting a range of requirements on what local government must do to adhere to those regulations. While these are supposedly negotiated between plaintiffs and local government, the plaintiff's lawyers usually have the upper hand. "Every recent New York mayor has discovered that his ability to change city policy is sharply curtailed by such judicial decrees. Every mayor has damned decrees for restricting choice, distorting priorities, and frustrating reform. But every mayor â€¦ has authorized the city to consent to more of them," Schoenbrod and Ross Sandler, a former New York City transportation commissioner, wrote in City Journal in 1994. The mayors agree to the decrees in order to end the legal battle, implement policies that they may support and "transform themselves from lawbreakers into law implementers." But the decrees never end, says Schoenbrod who, with Sandler wrote a book entitled Democracy by Decree: What Happens When Courts Run Government. A decree arising out of a case filed in 1975 governs aspects of special education in the city. Court cases from the 1970s and 1980s oversee the city's treatment of the homeless. The Citizen's Budget Commission recently published a report entitled "The Myth of the Uncontrollables," (.pdf format) that argues that mayors may not be as powerless as they claim. "These are large, large items," said Elizabeth Lynam, deputy research director of the Citizens Budget Commission, "and the city should be pounding on the bully pulpit and saying we're not going to tolerate it. In many cases, the city itself made decisions that led to some of these expenses. Medicaid, a federal program to provide health insurance for the poor, is jointly funded by Washington and the states and has become "the poster child for unfunded mandates," said Lynam. It ranks high on the mayor's list of nondiscretionary items. Unlike many states, New York requires local governments to shoulder a substantial share of the state portion of Medicaid costs -- about 18 percent for New York City according to a 2003 report (.pdf format) by the Independent Budget Office. To make the budget situation worse, Washington gives states a great deal of latitude in determining what services to provide under Medicaid. Albany has been very generous, making New York's program the most expensive in the country, the IBO report says. Bloomberg estimates the city will spend $4.9 billion for Medicaid next year and $5.3 billion by 2009. Local officials from throughout New York State have sought to have Albany pay more of the Medicaid costs. But with the state facing its own budget woes, a major shift seems unlikely. "Merely redistributing the burden is not enough," Governor George Pataki said in his 2005 budget address. "The state can no more afford to pay for the current and future costs of Medicaid than counties can." Instead, Pataki made several proposals, generally described as modest, to cut spending and bring in revenue. These include putting a cap on local Medicaid spending, cutting some reimbursement rates to hospitals and nursing homes, and raising their taxes. The legislature has rejected some of these measures in the past, according to the Albany Times Union. This year, the union representing health care workers has campaigned against the changes, saying they threaten "our frail elderly, our millions of uninsured New Yorkers, and our sick and injured children" and would damage large academic medical centers, which the union calls "the crown jewels of New York's healthcare system." But in "The Myth of the Uncontrollables," the Citizens Budget Commission recommends further cuts, including reducing payments to hospitals and nursing homes, greater use of managed care, and limiting the number of hours a patient can receive service from a home health care attendant. The city and state should work together, Lynam said, to stem "the flow of benefits to middle and upper middle class people in the state" while preserving help for the poor. To comply with the federal law to insure Americans have clean, healthy water, New York City must build a plant to filter drinking water from its Croton Reservoir system. The city Department of Environmental Protection's 10-year capital plan issued in 2003 includes about $1.5 billion for the facility. Some of this money will be financed through the sale of bonds, some from increases in water and sewage fees, according to the Independent Budget Office. For now, Washington has let the rest of the city's drinking water remain unfiltered. But if the reservoirs were to become polluted, the federal government could require additional filtration plants costing $6 billion. Speaking to a presidential commission in 2002, then New York Schools Chancellor Harold Levy complained of what he saw as excesses in federal rules intended to insure disabled kids get a good education. Affluent parents get the city to pay for expensive private schooling and drain "resources that are critically needed for the system," he said. "You cannot give one kid the Cadillac and the others the back of the bus." But not all students use the laws to win expensive educations. And advocates say the laws, regulations and courts are needed to insure that the city does not neglect students who need extra help. They could point to another autistic child, identified as A.J in court papers (.pdf format) filed by Advocates for Children. His individual education plan - a document required for all special education students - called for him to be in a regular classroom. But in fall 2002, his Brooklyn elementary school removed A.J. from all his classes and kept him alone in a room with only an aide for instruction and company. He was allowed to return to his regular class only after Advocates for Children instituted a hearing for A.J. and his guardian. According to one estimate, the city spends $2.7 billion a year on special education. While much of the money goes to services within public schools, the Department of Education will also pay for about 6,200 kids to attend specialized private schools this year. Despite federal law and court rulings, the city may have more options than is often claimed, Lynam said. "Once a kid is in special ed, there is a mandate, but the city has a large degree of control over whether a kid gets into special ed," she said. In the past, the Citizens Budget Commission has urged the city to take steps to provide needed services to kids while not classifying them as special education students - a designation that sets off a chain of rules and requirements. Pensions, health insurance and other fringe benefits for city employees and retirees continue to rise. Bloomberg has budgeted $9.6 billion for these items in 2006 and expects them to increase by another $1 billion by 2009. In some respects, the city has tied its own hands here. In negotiations with its unions, it agreed to various benefits that it must now honor. But Albany has played a role too. For example, it passed a law giving retired public employees cost of living increases in their city pensions. This will cost the city $820 million a year by 2010, according to Doug Turetsky of the Independent Budget Office. And the state constitution requires that current workers receive the pension plan now in effect. But nothing stops the city from trying to persuade the legislature to adopt a new plan for future employees, the Citizen Budget Commission says. It recommends that the city switch from its plan that guarantees a benefit to a "defined contribution plan," where employers and employees put in a set amount that is then invested for use upon retirement. This type of plan is now favored by the vast majority of private businesses. The city could also end its unusual practice of letting overtime pay count toward pensions. Like most employers, the city is seeing the cost of providing health insurance to employees rise. While some of that is unavoidable - a product of the overall health care situation in the country -- the Citizens Budget Commission notes that the city is more generous with health insurance than many employers. For example, it says, city employees and retirees, unlike most other workers, do not contribute to the costs of their health insurance. This could be changed in future agreement with municipal employee unions. The money New York must now pay to service its debt was originally very much under the city's control -- citizens wanted schools, roads and other capital projects and the city borrowed money to pay for them. But now the city has to pay back the loans - with interest. This will cost $4.3 billion and climb to $5.8 billion in 2009 - an increase of more than 36 percent, the city says. "Every dollar spent on debt service is a dollar that you don't spend on the day-to-day expenses of the city," Douglas Offerman of the Citizens Budget Commission has said. Some budget advocates recommend cutting debt service in the future by building projects more efficiently or by switching some capital items to the operating budget. In its report, the Citizens Budget Commission calls for spending some of the city's current $3 billion surplus to pay off debt. Any major change in unfunded mandates facing New York and other cities would have to come from Washington. And so in the 1990s while Giuliani complained about unfunded mandates in New York, Republicans made unfunded mandates and the court orders a linchpin of their Contract with America. "Americans do not want Washington, D.C. running schools, college, law enforcement, city parks and most roads," Senator Lamar Alexander of Tennessee, a staunch opponent of unfunded mandates, said. "Put too may one-size-fits-all jackets on Americans, and this country will explode." In response to such concerns, in 1994, Congress passed and President Bill Clinton signed the Unfunded Mandates Reform Act. It required that congressional committees estimate the costs their actions would place on state and local government and private companies. If the expense was estimated to be above $50 million a year ($100 million for companies), a majority of Congress had to agree the benefit was worth the cost. The law did not eliminate any existing requirements; it merely restricted Congress' ability to create new ones. And it does not bar Congress from cutting funding to finance existing programs, leaving the state to pick up the slack. Despite the limitations, the Congressional Budget Office concluded that the number of bills containing mandates that would be covered under the law decreased by more than a third between 1996 and 2002. The measure has "fundamentally changed the relationship" between the national government on one hand and state and local government on the other, one of its sponsors, Dirk Kempthorne, now the governor of Idaho, said on the law's 10th anniversary. But others are less effusive. The law "is a step in the right direction, but still quite a limited one," Pietro Nivola of the Brookings Institution has written. To tighten the law, Congress recently approved a report requiring a 60-vote majority in the Senate to approve an unfunded mandate. Until then, a simple majority was enough. Alexander has proposed the Federal Consent Decree Fairness Act aimed at the courts. Other have suggested that the federal government adopt a law saying no government could pass a law requiring a lower level of government to pay for a program without compensating them. This would apply to Albany as well as Washington. But Brian Riedl of the Heritage Foundation and some other conservatives counter that the education law is not an unfunded mandate because states do not have to comply with it - if they are willing to give up millions in federal education money. As politicians seek to limit unfunded mandates, new ones loom on the horizon. Congress recently passed a law requiring people applying for driver's licenses to show more identification. It will also bar undocumented immigrants from getting driver's licenses. Some critics see this as yet another unfunded mandate - creating headaches, increasing bureaucracy and costing the states $750 million. And if it is upheld on appeal, the court ruling that the New York City schools receive an additional $5.7 billion in city and state funds could turn out to be one of the biggest unfunded mandates of them all. What Can Any Mayor Really Do? A report on four areas of spending often viewed as beyond a mayor's control and what the city can do about them. by David Schoenbrod and Ross Sandler. How the courts control public policy. A look at how the Unfunded mandates Reform Act has worked and what other measures could be taken. The Bush administration seems indifferent to the budget crisis in the states. How the unfunded mandates add up. A discussion of efforts to limit court decrees. A fellow at the conservative Heritage Foundation argues that the state's budget woes should be blamed on the states"